Thinking about giving evidence at The Royal Commission? It’s hard to know what to expect. But it’s really not as scary as you think. 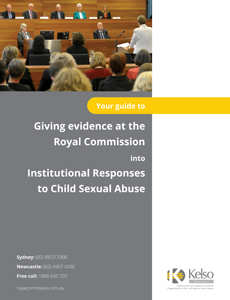 To ease your mind, we’ve put together a free downloadable ebook to help you understand what it’s like to give evidence at the Royal Commission. We explain the entire process from start to finish so that you know exactly what you need to prepare for. The Kelso’s team are experts in achieving justice for victims of child sexual abuse. Our experience at the Royal Commission can help you fight for an apology, compensation and justice. We developed this guide to use that experience to put your mind at ease. The decision whether or not to share your story is always a challenging one, but after reading this guide, you won’t have any uncertainties about the process of giving evidence with the Royal Commission.